I’m literally drooling to make the colorwork bag in this magazine. Gotta meet some more deadlines before I get all reckless and start fun projects, though. Get Hooked was awarded a 4-star (out of 4!) review and is listed as “highly recommended” by The Manitoba Library Association‘s Canadian Review of Materials. The reviewer’s daughter loved the book, and has even made a few projects from it. The review is quite long; I only quoted a small bit of it. Woo hoo! When we were in New York for the MOTC book tour, I had the pleasure of spending time with crochet designer Dora Ohrenstein (look for a fab design of hers in Chain Reaction next fall). She’s just published our chat in Crochet Insider. Check it out for all sorts of stuff about Crochet Me, my terrible singing voice, the hotness of crochet right now, and why it’s important to write well. I’m not sure about the retro-inspired part, but I’m so glad they liked it! I wrote the Ravelings essay in this issue, and Get Hooked designer Annette Petavy has two patterns in it (they’re my favourites, too). But wait! There’s more in Crochet Today’s review: “We really love: The designs require only beginner skills, but are interesting enough to keep experienced crocheters hooked, too.” For that, of course, I must give a huge shout-out to the fabulous designers who came up with awesome patterns for the book. We worked long and hard to make simple designs look uber-cool, even for advanced stitchers. You can learn more about the designers by following the links here. 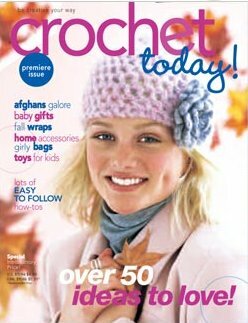 There’s a new crochet mag coming out, and it looks to be a great one. Crochet Today will launch sometime in August (one of my amigurumi patterns will be in it), and there’s a sneak preview on the Coats & Clark web site — featuring what looks to be a review of Get Hooked! Woo hoo! Free Patterns to Get You Hooked!